I rediscovered this photo when I was flipping through old photos on my facebook and I had to post it. Sorry for the quality. 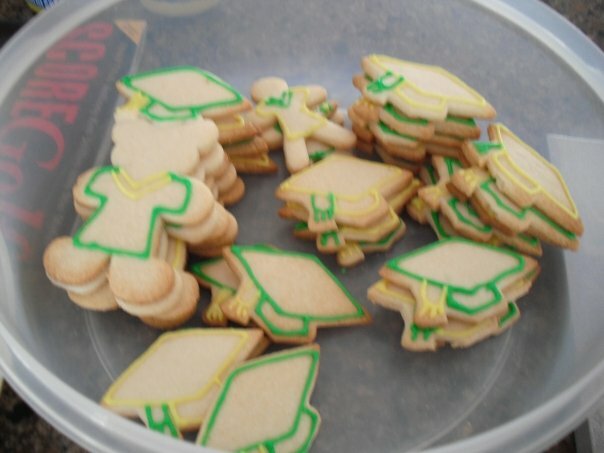 A couple years ago, I made sugar cookies for Nathan’s high school graduation. (To put this in time perspective, Nathan went back to school for grade 13 – an Ontario thing – and now he’s in the middle of his first year of university for Mechanical Engineering). I found the graduation cap cookie cutter at Bulk Barn and the teddy bear and boy cutter is part of my Mom’s Christmas set. 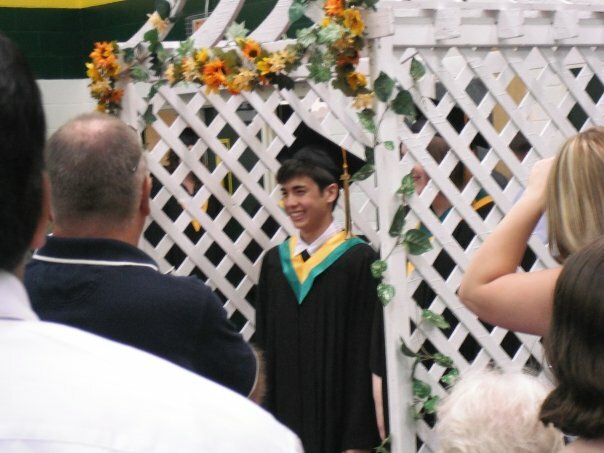 Since Nathan’s school colours are yellow and green, I decided to make the icing match his graduation robes. This was my first real venture into making some sort of decorative cookies and it definitely hooked me. 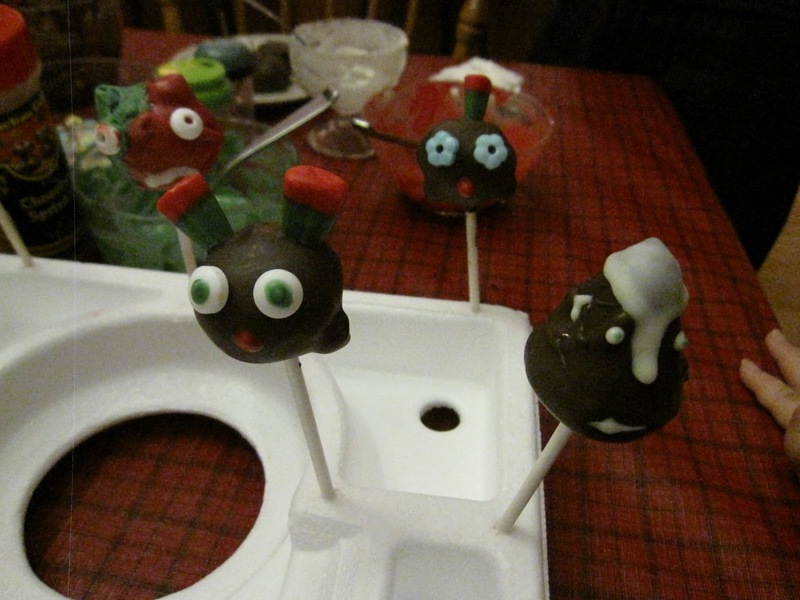 Nathan and I made these during my last few days at my parents’ during the holidays. I think we were all “chocolated” out from Christmas, so these were a nice change of pace for dessert. I got the recipe from Melissa at Mel’s Sweet Treats and she piped the meringue like one would icing on a cupcake. I tried to do the same but the batter was a little runny. According to Nathan, I didn’t beat the egg whites long enough. Oh well, live and learn! Nathan used my Mom’s Pampered Chef Easy Accent Decorator, which has a pump to squeeze out the icing in perfect little swirled circles. He thought he was so clever, but what fun is baking if you can’t get elbow deep in sticky meringue batter? 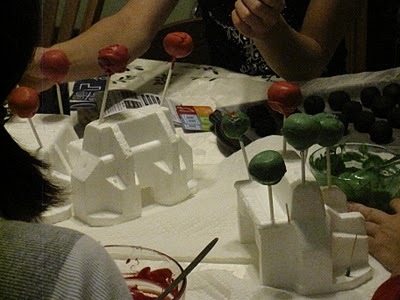 (I’m still at the learning stages with grasping with the icing piping bag). My tray was on top and Nathan’s on the bottom. 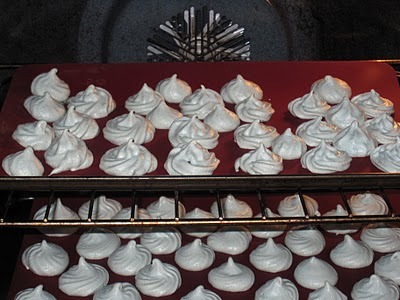 Despite looking different, they were very delicious and my family gobbled them up. Only five remained the following morning. If you read my personal blog, you’ll know that I heart Bakerella and I actually got to meet here when she came to Toronto on her book tour. 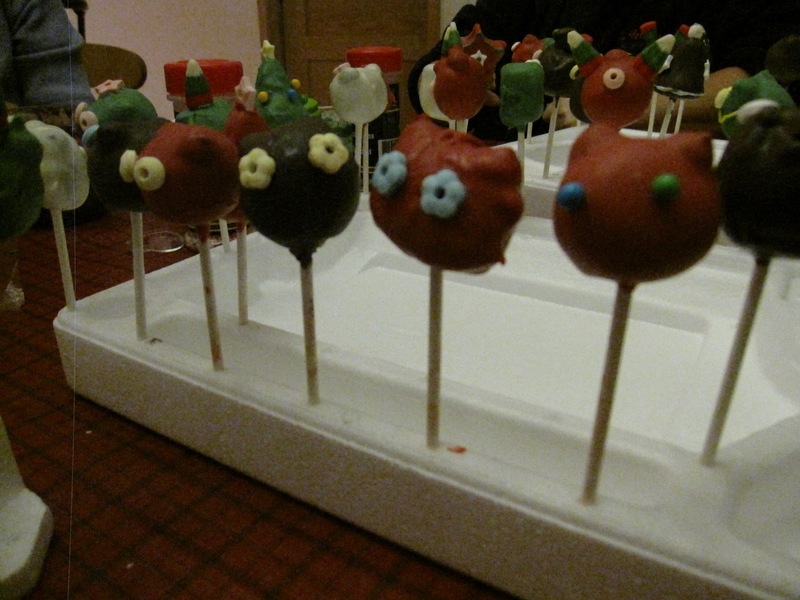 I had tried unsuccessfully to make cake pops once, but this time I decided to take advantage of my Christmas holidays and some help with the family. I bought a ton of candy melts from Michael’s and some lollipop sticks and took my book home for inspiration. The first time we made them, we used chocolate cake and chocolate frosting, since that was all we had in the house. I’m not a big chocolate cake fan (weird, huh?) 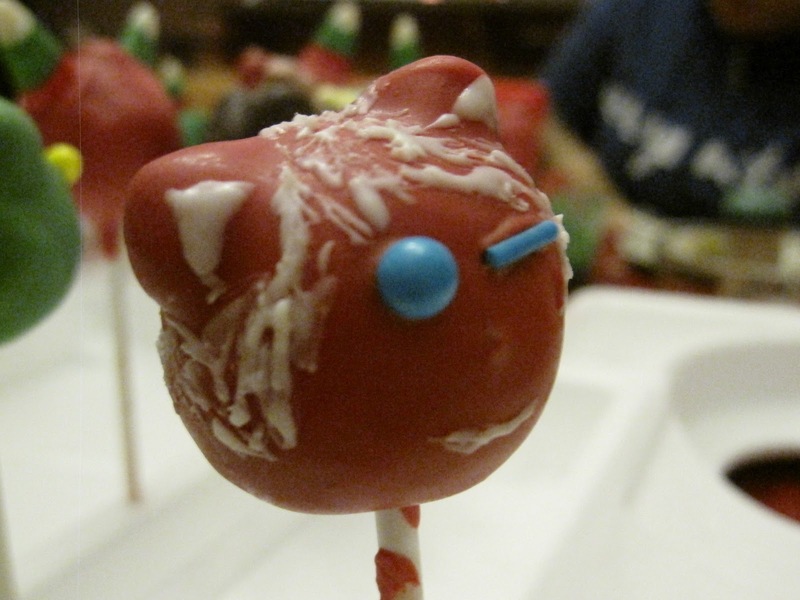 and we had trouble keeping the candy melts thin enough to keep the cake pop’s surface smooth, but I thought it went pretty well for our first collective attempt. Our second attempt, I used lemon poppy-seed cake (add poppy seeds to the lemon cake batter for a surprise, crunchy result) and vanilla frosting. This time around, I decided to be a little more creative and added chocolate chips to some of the undipped cake balls for ears. 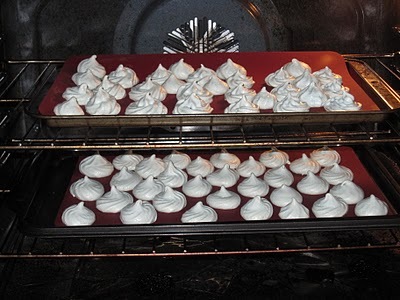 We also used vegetable oil to make the candy melts thinner and therefore easier to dip (although white was definitely the most co-operative colour). Everyone was involved in this activity, even my brother, who is usually hard to drag out of his room. I was inspired by the little owls Bakerella had made in her book and bought candy necklaces for the eyes. Only to my surprise, it included more than just round candy, but also star and heart shaped pieces. This made for many more decorating ideas. My mom got tired of using the chocolate chips as ears, so she flipped some upside down and used the chips as legs. 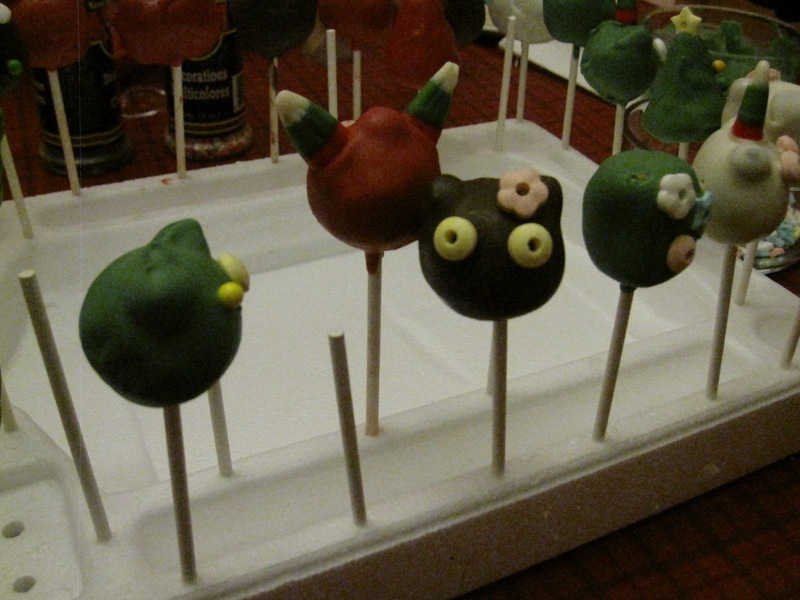 These “turkey” cake pops turned out to be the cutest of the bunch! 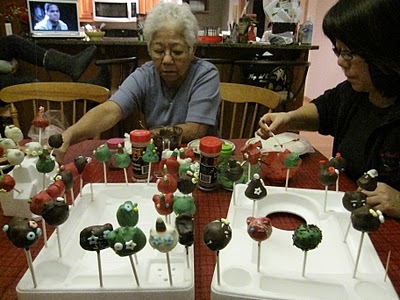 My brother especially enjoyed painting hair on the dried cake pops with the remaining candy melts. How cool does that look? In the end though, as pretty as the cake pops were, we had to eat them. I think that was the best part! To find out more about making cake pops, I highly recommend checking out Bakerella’s website or purchasing her book.